Sharon Hospital in Sharon Connecticut held a cross-functional teambuilding event for employees in the cafeteria of the hospital on Saturday morning, November 14th. Employees had the option to sign up for the event and approximately 20 employees came in over the weekend to participate. This was a great opportunity for individuals in multiple departments to spend time learning about co-workers and working together. Some thought it was an interesting alternative to raking the leaves that weekend! Participants were so anxious to get started that they jumped right in and started putting together bicycle parts! Leader’s Institute® Instructor reined them back in and went over what they were going to do leading up to that part of the event. With some recent changes at the hospital, this was a great morale booster and the teams took their “assignments” quite seriously. One of the executives who was assisting with some of the “team challenges” had a hard time not giving away clues to the teams that were struggling a bit but overall, kept a straight face! After quite a bit of activity, the groups collaboratively assembled 6 children’s bikes and of course, carefully inspected each one to ensure that no-one would be coming through the hospital doors from an unsafe bike! At the end of the event, the Executive Director at Housatonic Youth Service Bureau arrived to tell employees about his organization. The Housatonic Youth Service Bureau’s mission is to create a supportive environment and empowering experiences where children and young adults can embrace their full potential as individuals, as students, as family members, and as community members. A 501c3 nonprofit, HYSB responds to the needs of the youth living in the Region One School District. The towns include North Canaan, Canaan, Salisbury/Lakeville, Sharon, Cornwall and Kent. Sharon, CT is a small town with a population of not quite 2800 people. 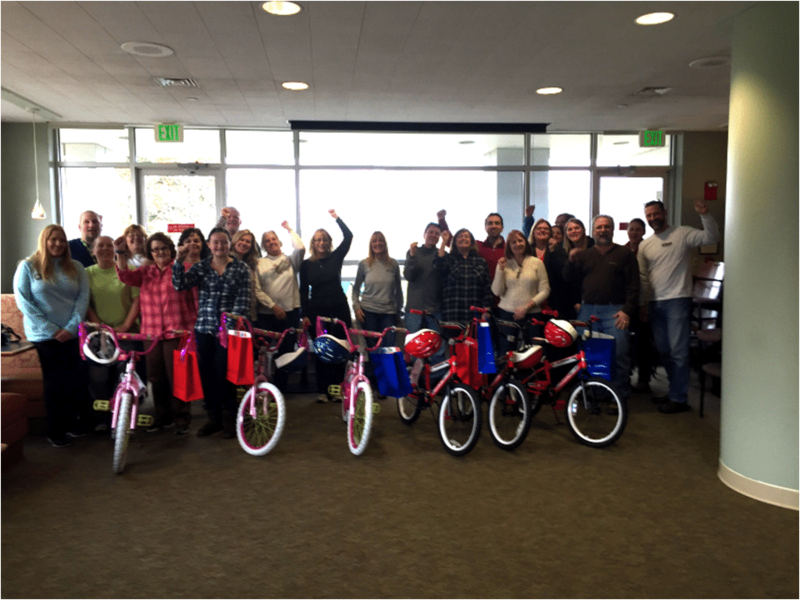 The cross-functional teambuilding participants at Sharon Hospital were thrilled that their efforts would positively affect the lives of 6 children in need right in their own backyard.